The food in this post were provided by Arizona BBQ Company but the opinions expressed here are my own. It was a cool fall morning as we set off on our 2-week road trip from California to Alabama for the 2018 World Food Championships. We learned a lot about this road trip last year and decided to stretch our first leg from California to Alabama to 4 days instead of 3 days. By doing this: 1) We didn’t have to wake up at the crack of dawn to get back on the road. 2) We were able to take advantage of the free breakfast at the Hilton Hotel properties where we stayed. 3) We were able to get to our daily destination at a reasonable hour so we could unpack the car and have a relaxing dinner. 4) We were able to get a good night’s rest before the next day of driving. 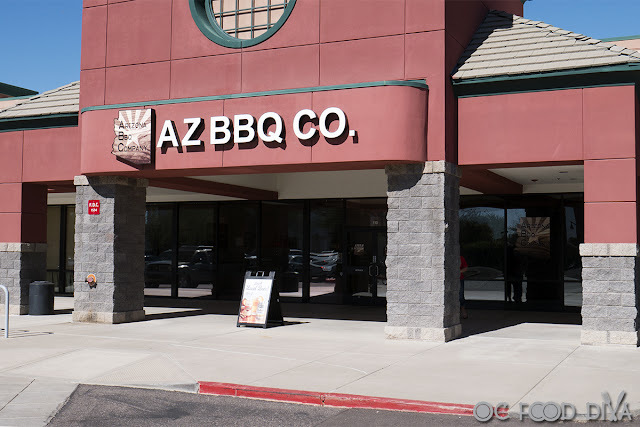 Our first stop was Arizona BBQ Company in Gilbert, AZ. It is a little bit off the beaten path from the I-10, but a worthy stop indeed. We got there just in time as Mark Colette, owner/operator and pit master, was opening the smoker to unload tasty pork and brisket. 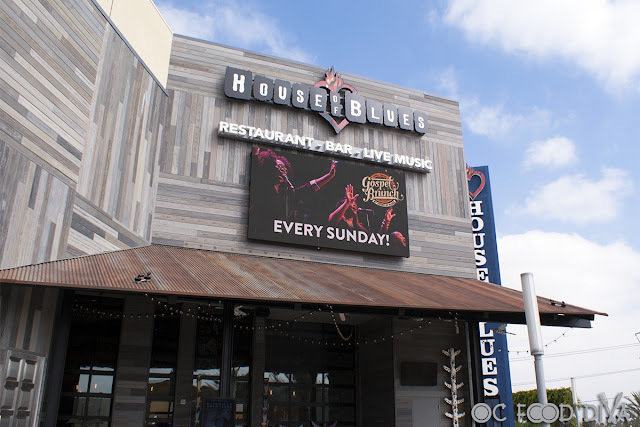 Mark runs the back of house, while his wife, Colette, President & CEO, runs the front of house and is the face of Arizona BBQ Company. You can see the heart and soul this couple puts into everything they do: making their guests feel at home, making great BBQ, and supporting their local community. Four Peaks Combo Platter is loaded with ¼ lb. brisket, ¼ lb. 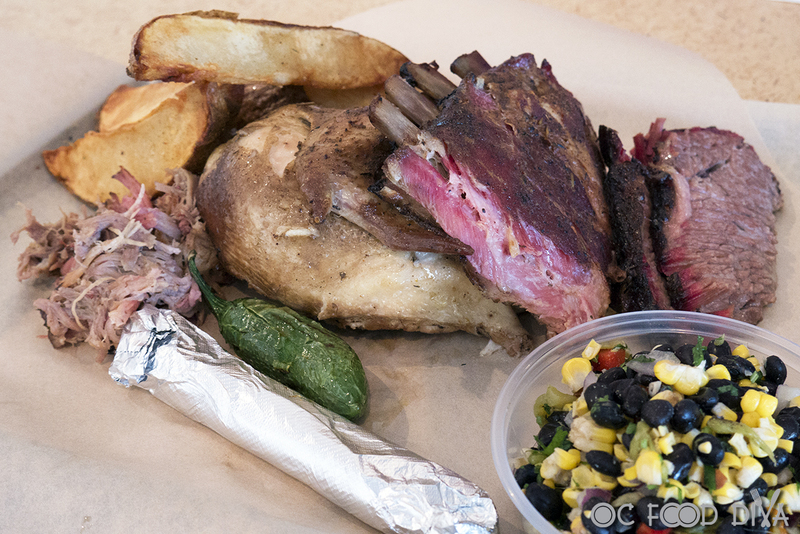 pulled pork, ¼ smoked chicken, 1/3 rack St. Louis Ribs, choice of two sides (potato wedges and black bean and corn salad presented), and choice of corn or flour tortillas. As a KCBS BBQ Judge, this is my first choice on a first-time stop at any BBQ restaurant. It comprises the four submissions in judging BBQ competitions: pork, chicken, ribs, and brisket. 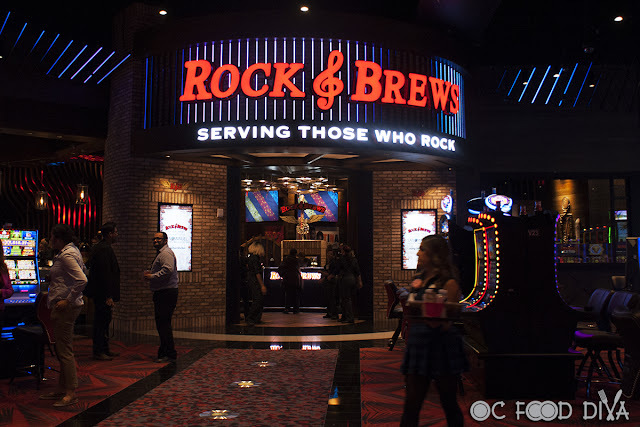 It is also a great way to sample your way through the menu and find your favorites. I have to say, this is one of the best BBQ samplings I have ever had. The brisket passed my bend test as a judge, had a beautiful smoke ring, and tender texture. Just needed a tad more salt since I don’t usually use sauce, but in a restaurant you can always add. The St. Louis Ribs had a beautiful smoked color, smoke flavor permeated the meat, and were just fall-off-the-bone delicious. The smoked chicken also had a beautiful smoked color and was perfectly tender and juicy. The pulled pork was pulled just right, and tender as can be. The potato wedges are HUGE! A whole potato is wedged providing the ultimate “steak fries”, crispy on the outside and tender like a baked potato on the inside. The black bean and corn salad was a refreshing Southwest take on “BBQ beans” with the starchiness from the black beans and natural sweetness from the corn. I loved that they serve the platter with tortillas. You can make your own tacos! Who doesn’t love tacos?! 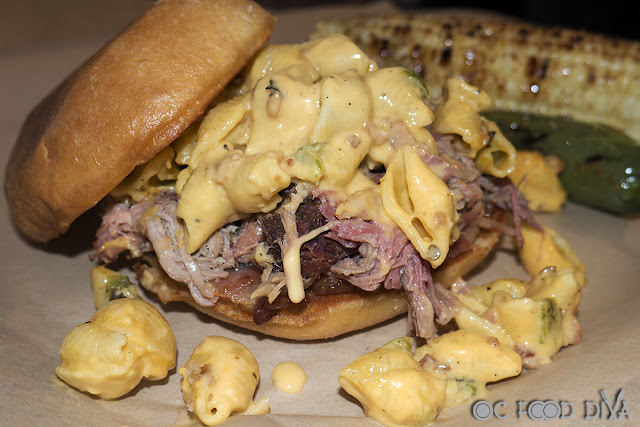 Pig Mac is a half-pound sandwich served on a brioche bun topped with thick-cut smoked bacon, pulled pork, green chili mac n’ cheese and served with one side (chili lime roasted corn presented). WARNING: Have napkins ready because this is a messy one, but so worth it! On paper, I wasn’t sure how this was going to taste but so glad I tried it. 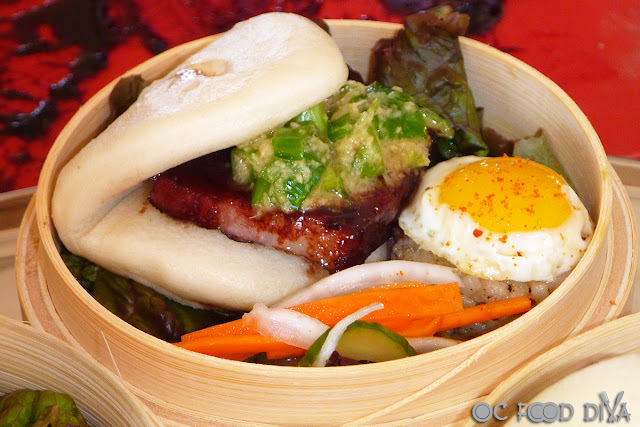 I love brioche buns! Check! I love smoky bacon! Check! I tried their pulled pork on the Four Peaks Combo and loved it! Check! I love anything with green chiles and cheese in it! Check! I’ve never had a sandwich check so many boxes all in one bite! Totally Instagram worthy and tastes amazing too! 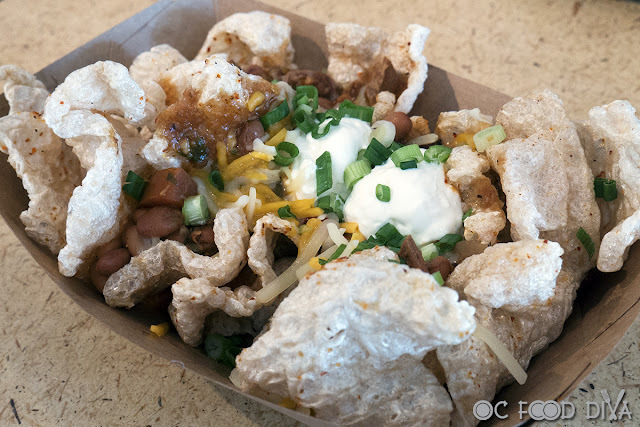 Loaded Chicharrons are house made chicharrons topped with brisket chili, sour cream, cheddar cheese, and green onion. They were served still crackling which was just music to my ears! Think low-carb nachos! The chicharrons were light like crispy clouds. The brisket chili, cheddar, sour cream, and green onion were the perfect toppings! I’m in love! Arizona BBQ Company is a must-stop for any BBQ aficionado. With our tummies full, it was time to hit the road to our next stop in Tucson, AZ.